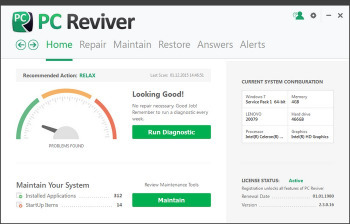 PC Reviver portable is a multi-purpose utility that will diagnose errors on your PC, safely repair them, and provide other maintenance and optimization recommendations.PC Reviver is the trusted and recommended way to restore optimum performance and stability to your PC. • PC Reviver includes advanced diagnostic tools that will perform a comprehensive and complete scan to find problems with your PC. PC Reviver will safely fix these problems and perform other optimizations to restore optimum performance and stability to your PC. • Safely and securely delete old, unused and junk items to free up space and memory to give your PC a boost. Set reminders and schedule tasks to perform automatically to ensure that your PC continues to perform at its best. • Direct access to our ever growing library of informative articles and instructional videos will help you get the most from your PC and hardware, and learn more about how to Love Your Computer Again™. • ReviverSoft products have been awarded the highest of accolades from industry experts including PC World, Digital Trends, CNet, LAPTOP Mag and many others. You can be rest assured that your PC is in safe hands with PC Reviver. • Create a secure Backup of your PC drivers in the event that you need to restore them at a later date. • Choose which programs and services launch on Windows Startup to improve boot times and overall PC performance and stability. • Manage all installed applications and thoroughly uninstall programs based on recommendations or at will. • Safely optimize your Registry by compressing its hives making it smaller, more compact and therefore more efficient. • Find out why your computer is crashing (or has crashed) and find a solution to the cause. • Manage what application is used to open a specific file extension. • View the processes operating on your system quickly and easily. • View and save a report detailing your system information including software and hardware settings, and other useful information. • Direct access to our community of experts to answer any of your technology related questions. • Identifies errors in your Windows Registry and quickly and safely repairs these errors to restore optimum performance and stability. • Identifies all out of date and obsolete drivers and quickly installs current drivers, sourced directly from the original manufacturer. • Thoroughly clean privacy tracks, delete cache and other temporary data that can take up valuable disk space and cause security issues. • Quickly and easily check for updates to Windows and safely uninstall previous installations.